Community Reading Buddies (CRB) aims to close the literacy gap that exists for children in the Oakland by spreading the joy of reading. 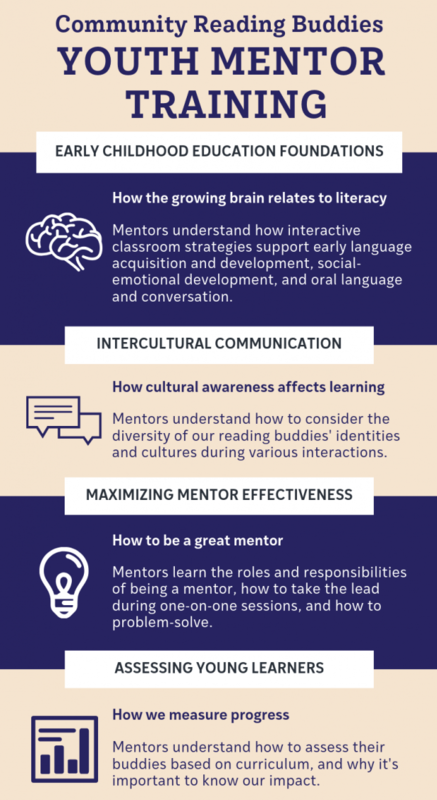 Through mentorship and evidence-based early literacy education, young students grow a love of reading, setting themselves up to succeed in further language development. Additionally, by working with East Bay youth as our mentors, middle and high school students build leadership skills and give back to their community. Over the course of eight weeks, over 150 middle and high school "Youth Mentors" provide one-on-one literacy intervention to preK-3rd grade "Buddies" across three Oakland childhood development centers. Youth Mentors meet with their Buddies twice a week to work on early literacy foundations and support them in developing a genuine love of learning. Ready to be a youth mentor? Community Reading Buddies 2019 is now accepting applications for youth mentors! Through interactions with their Youth Mentors, Buddies also work on cognitive and social-emotional development such as attention maintenance, critical thinking, expressing emotions, and social understanding. Learn more about our curriculum. Learn more about becoming a youth mentor. Community Reading Buddies needs your support! Click the image to download a PDF version. According to the American Academy of Pediatrics’ Council on Early Childhood, “reading with children in their… preschool years is associated with higher language skills at school entry and with childhood literacy acquisition." CRB uses evidence-based, interactive techniques to address literacy foundations in several areas. 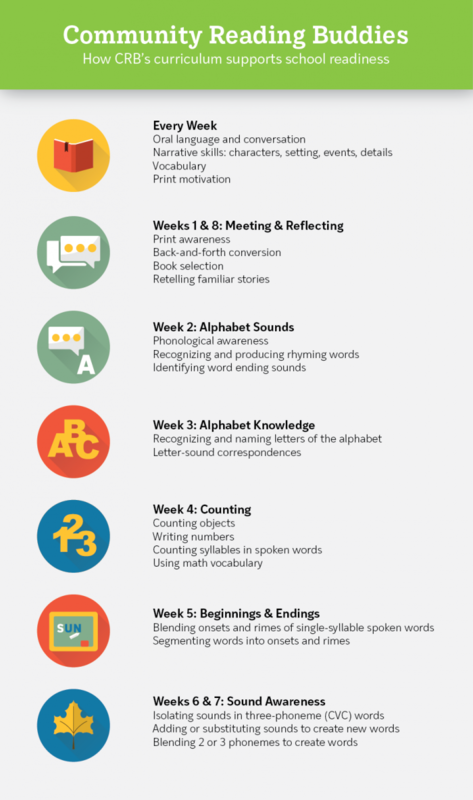 Each week focuses on a specific literacy foundation. Buddies start off choosing a book from our curated mobile library and spend 45 minutes reading with their Youth Mentors and doing activities related to the week's focus. Throughout the program, we hone skills such as oral language, narrative skills, vocabulary, and print motivation. Play is an important aspect of children's social-emotional development, so we follow the reading session with 45 minutes of outdoor time that includes both one-on-one and group activities, all led by our Youth Mentors. We provide our Youth Mentors with the tools and foundations of early childhood learning so that they can be thoughtful, effective mentors. Readiness involves a half-day training, pre-training before each program session, and a debrief at the end of each program session. CRB partners with Tandem, Partners in Early Learning to provide our Youth Mentors with comprehensive training on how early learners think and develop. The training gives our mentors tangible techniques on how to engage their Buddies in the weekly topics, activities they can do with their Buddies, and intercultural communication. Family Reading Nights bring together families to share in the love of reading. We host these family events throughout the year in partnership with Oakland’s childhood development centers and Tandem, Partners in Early Learning. The reading nights engage whole families, with literacy stations run by our Youth Mentors, parent workshops to promote reading at home, and local author signings and book giveaways for each family and teacher who attends. The fun and activity-filled evenings bring families together to experience the impact reading in the home has on their children. The minimum commitment is 4 hours per week (2 hours per day) for 3 weeks between June 10 and August 2, 2019, however, you can volunteer up to 20 hours per week. The entire program is 8 weeks long, and we encourage our Youth Mentors to commit to the full eight weeks in order to build a strong relationship with their buddies. Click on the button below to be put on our mailing list for more information. When available, fill out an online application and submit a parent permission form. "Reading Buddies taught me patience and diplomacy. My buddies were super enthusiastic; however, they liked to try and be the leader and create a lesson plan for the day. I learned to find a middle ground between what they wanted to do and what the lead mentors and I wanted to do." "Reading Buddies helped grow my leadership skills and helped me communicate with people that I hadn't met before." "Reading Buddies helped me to grow as a mentor and leader. I learned that it takes an entirely different approach to encourage reading/literacy techniques. I learned to adapt my methods for the levels of my buddies and how to make reading more of a game to keep them involved"
"Reading Buddies forced me out of my comfort zone, in a good way. I learned to be more responsible and gained valuable people skills. Reading books to kids requires patience and understanding the pace of the buddy you are reading to, their learning style, and that everyone is different. Trying to keep your buddy engaged with a book or activity is a lot more difficult than it seems and CRB helped me balance multiple things at once. Overall, I am a more confident and understanding after being a mentor." Aspire Education Project is a 501(c)(3) organization (EIN: 20-5274459) dedicated to providing high-quality education services to all students. © 2019 Aspire Education Project. All rights reserved.